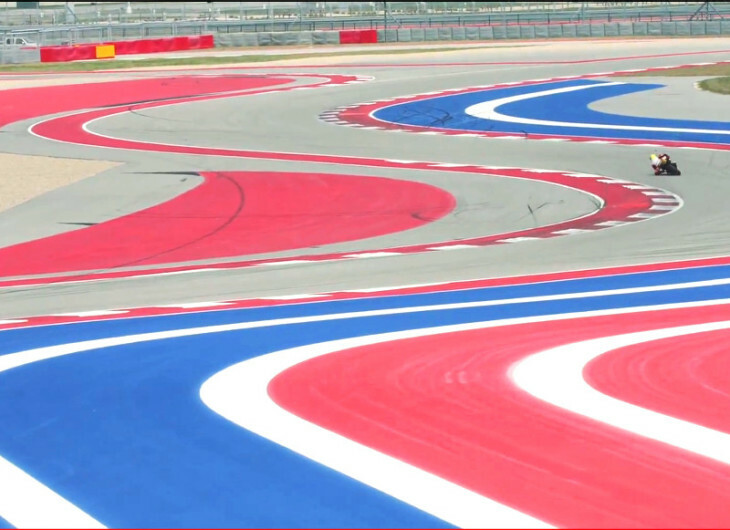 Don’t get hung up on the promotional nature of this video, because it is a nice summary of the goals of the new American race series led by Wayne Rainey, MotoAmerica, and also provides a close look at the beautiful COTA facility. Worth a look. Wayne is a Class Act. He’s going to be good for MotoAmerica. A lot of work lies ahead for them. I attended 2014 COTA MotoGP. Comparing MotoGP leaders’ speed through the S turns with huge run out (sorry, forgot the turn numbers), it’s like the R6 dropped anchor. The difference in speed in that particular area of the track is shocking. Possibly to be expected, considering one is purpose built liter race bike, the other a modified street legal 600. On a related note, it would be interesting to compare apex speed Moto2 vs. Moto3 vs. MotoGP. All three are purpose built race bikes, listed in ascending order of weight and engine displacement. I suppose, right at the apex, speed of each class is successively slower. But braking is probably very close, and acceleration wise obviously listed in ascending order. Lap speed is obviously faster per each successive class. The 250s are fast, the 600s blew away the 250s, and MotoGP is so fast is shocking. COTA is worth attending. I intend to return for 2016, even if MM does seem to own the track, which so far he has shown to be the case. I really appreciate all you and your crew is doing @ MA, Wayne. I will contribute by going to at least 1 of your MA races(Laguna). Wish you all the best. GOOD BY NASCAR Thank God. Lets get the USA back in WSB and GP. Thank you and good luck.